Meat processor has made an unbroken string of payouts since 1928. Meat processor Hormel Foods (NYSE:HRL) announced yesterday its second-quarter dividend of $0.17 per share, the same quarterly rate it's paid for the past two quarters after it raised the payout 1% from $0.15 per share. The board of directors said the quarterly dividend is payable on Aug. 15 to the holders of record at the close of business on July 22. Hormel has paid quarterly dividends since 1928, making the latest payout its 340th consecutive dividend payment. The regular dividend payment equates to a $0.68-per-share annual dividend yielding 1.6% based on the closing price of Hormel Foods' stock on May 20. 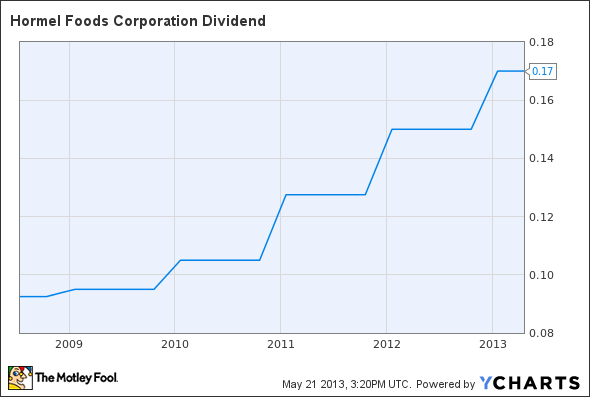 HRL Dividend data by YCharts.